While the diagram of one of our Missouri wetlands shown is not draw to scale as it is larger than it appears and offers an example of the number of duck blinds that may be hunted. When calling in for a Waterfowl Reservations and recommendation (first year members) of where to go duck hunting we would identify the wetlands map from the online members only web site. The wetlands the maps are two part. 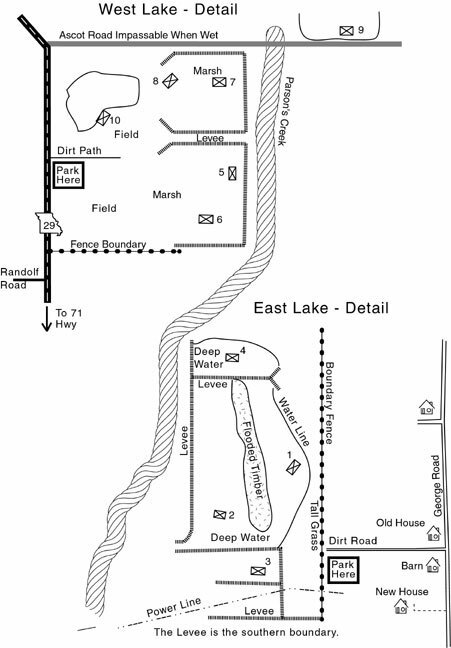 The first page shows how to get to the wetlands and the second page is a wetlands layout such as this sample. For many our wetlands habitat types of flooded crop fields, marsh lands, flooded sloughs through timber to open water will provide a variety to be experienced within one season. See some wetlands and duck blinds. When scouting to setup a large decoy spread the member would receive recommendations to a unit of property that will consist of several likely spots. 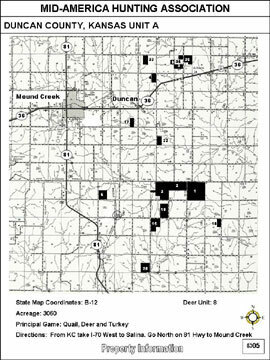 In the case of the unit map sheet above the acreage totals over 3,000. The unguided hunter is free to pick the one to set up a spread and hunt. Once a spread is set, it may remain there for the duration of the hunt through the member/hunter keeping his reservation up to date. 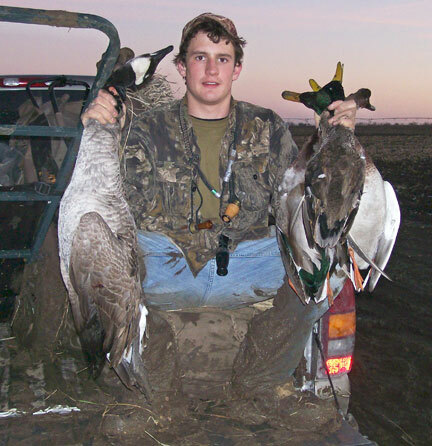 A common example are the goose hunters that team up Friday after work, set out a spread that night, hunt Saturday morning leaving the spread in place to hunt again on Sunday. Sunday afternoon the spread is picked up and the hunters return home for a Monday’s rest at work. Some of our wetlands are in good quail regions as well and the versatile dog hunter that has the energy can have a morning duck or goose hunt and an afternoon quail hunt. Our good through the best pheasant regions would be 2 to 5 hours drive from most of the better duck hunting areas and closer to some productive goose areas. For those wanting such a hunt we will be able to coordinate it by telephone giving more than one option for the hunter to select from. After the first season the member/hunter will have acquired enough first hand experience with the leases to make his own plans of which wetlands and upland bird unit lease he wants to hunt.